The Maptek Vulcan Advanced Reserves Editor reports the contents of a Vulcan block model within a specific triangulation region or other criteria. 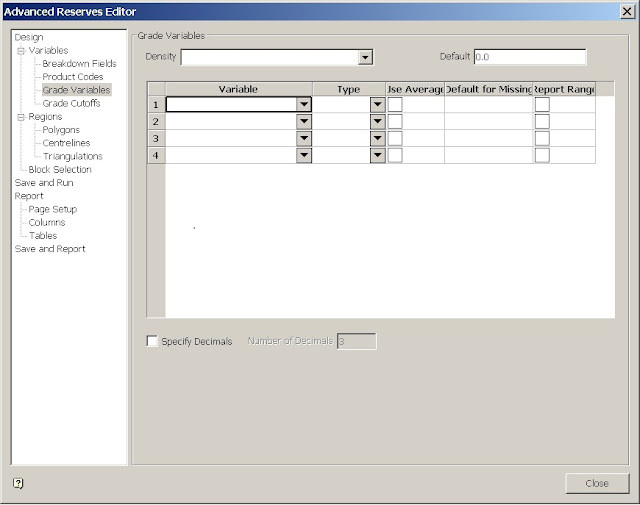 The Advanced Reserves Editor gives the user more flexibility than General Reserves (Block > Reserves > General) and can export the results in the familiar and user-friendly, comma seperated values (csv) format. The following is an introduction to the Advanced Reserves Editor. The Design tab of the Advanced Reserves Editor panel allows the user to create or select a specification file and to select a block model file. If the specification file entered does not exist, a new one will be created. 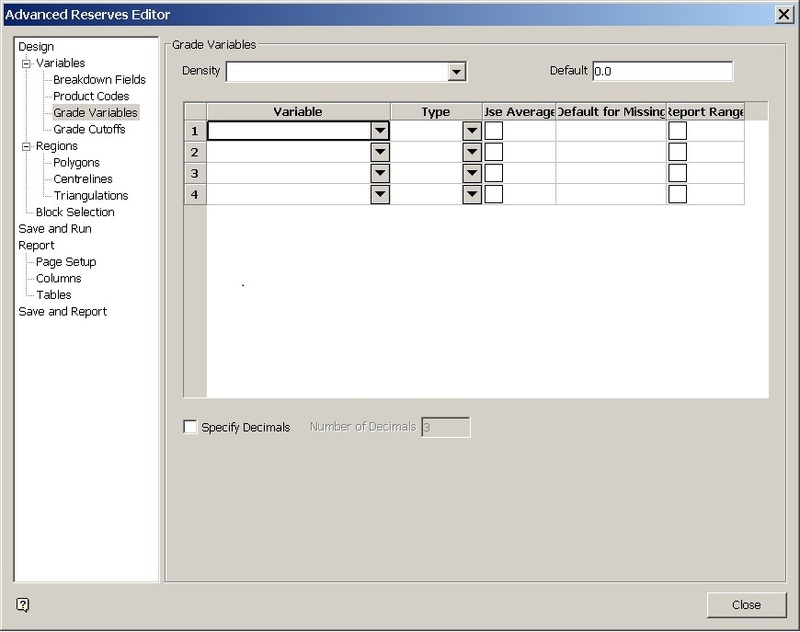 Under the Variables section, the most important subsection is Grade Variables. This subsection specifies the block model variables to be reported, as well as the density to be used. If both the density field and default density field are specified, the default value will be used for block model blocks that contain the default value for that variable, block model blocks do not have ‘missing’ values. All other variable fields must have a 'type' field set. Grade variables should be specified as a weight type (usually wt by mass), tonnage or dollar variables should have a sum type. Either ‘Use Average’ or ‘Default for Missing’ should be set for each variable. Generally, the ‘Default for Missing’ should be set to ‘0.’ Again, this is for those values which contain the variable default. No block model variables have ‘missing’ values. Don’t check the ‘Report Range’ checkbox. It is so simple to get the range of values in Microsoft Excel that this checkbox is superfluous. The remaining subsections under Variables (Breakdown Fields, Product Codes and Grade Cutoffs) break down the block model data by different criteria. This is not a basic function and will be addressed later. I will say that, if you have entered information in all three of those subcategories, you have probably done something wrong. Keep it simple until you have been through the panels several times. In the Regions section you are defining the three dimensional space used for calculating reserves. The Polygons and Centrelines sections both create triangulations on the fly based on specified CAD data. You can also create and define your own triangulations. These can be selected from the screen or by browsing to the appropriate folder. The default setting in Block Selection is to ‘Select all blocks’ and ‘proportional cell evaluation.’ The option to ‘Select all blocks’ can be changed by using the block selection panel. This is advanced functionality and will be addressed later. If triangulations have been defined, there is usually no reason to use any other setting. ‘Proportional cell evaluation’ refers to how much of the block model block should be used, based on how it intersects with the triangulation region. Blocks that fall completely inside or outside the triangulation are not affected by this setting but the blocks that intersect the boundary are. With this default setting the proportion of the block model block that falls within the triangulation boundary will be counted toward the reserves total, the proportion that falls outside will not be counted. The other alternative is called ‘Full cell evaluation.’ Using ‘Full cell evaluation,’ any block whose centroid falls within the triangulation boundary will count completely toward the reserves total. Any block whose centroid falls outside the triangulation will not be counted at all. Both ‘Select all blocks’ and ‘Proportional cell evaluation’ are the default settings because you want to use them in almost all scenarios. In the Save and Run tab you will want to click the ‘Save’ button. If this specification file already exists the ‘Confirm’ panel will pop up. Unless you want to save these settings as another file, go ahead and select ‘Replace.’ Next, you will want to check the box to ‘Output CSV file.’ I don’t know why this is not checked by default but if you want to use the file with Microsoft Excel you will want to check this box. Finally, select the ‘Calculate’ button. The calculation will spawn in a t-shell in a separate window. Open the results in Excel and manipulate as desired. 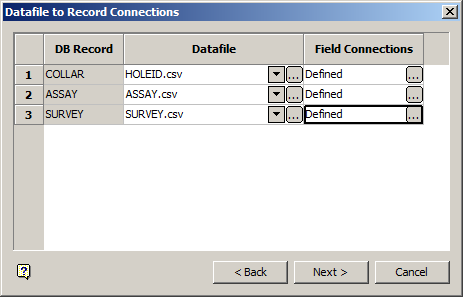 My Maptek Vulcan Database is Locked ... by Me?